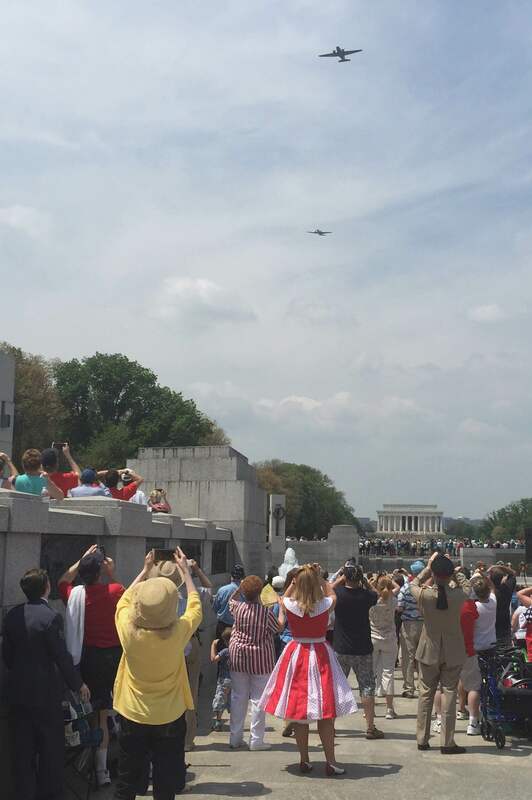 On Friday, I saw the WWII flyover on the National Mall. They called it the “Arsenal of Democracy” after FDR’s famous phrasing in 1940, a name which in our modern age are both comically overwrought and entirely American – perhaps representations of the same thing. It was the 70th anniversary of Victory in Europe Day, and 15 historically sequenced formations of historic military aircraft had been permitted to fly over the US capitol, sponsored by the Commemorative Air Force (a group whose existence I was until now entirely unaware of). 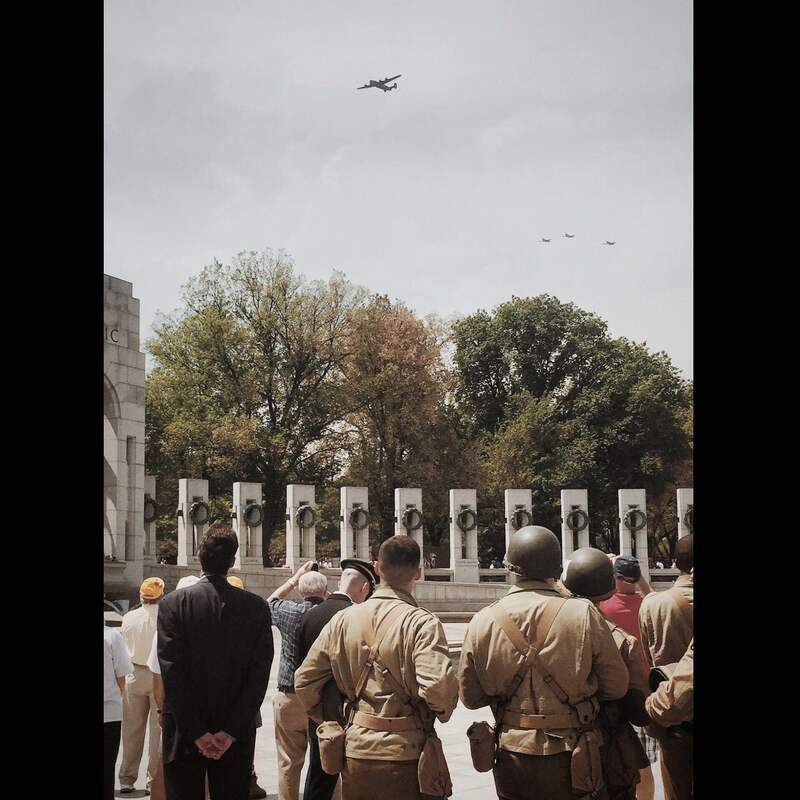 They would fly down the Potomac River, then fly over Independence Avenue – buzzing the World War II Memorial, where a group of veterans and dignitaries would gather, proceeding over the Washington Memorial and the Mall. I could not miss the thing, of course. This is one of the moments that makes enduring some of the indignities of DC, especially when heat-and-metro-outage season hits, slightly more worth it. When I think of WWII aviation and the war itself, how we remember it in this country – well, I think less of Europe and much more of the tropical remains of the war I’ve seen in Asia, the remains I will divert myself to go look at whenever they are available, as if I feel it is mildly incumbent upon me. And they are, in their way, neglected: the reminders of the war in Burma and in Chongqing don’t get the visitation and the affection that the sites in Europe do. As a friend noted on Twitter, the sites are reminders of a sweaty and brutal jungle war – and who romanticizes jungle warfare, with its insects, its rotting feet, its miserable sweat? We as Westerners are better at imagining great battles on stony beaches and in cities with lots of soaring cathedrals. This particular imagination is, I suppose, what fueled the Arsenal of Democracy. But me, I guess I am a tropical creature, if my life trajectory so far means anything. I remember being the only person knocking around General Stilwell’s house in Chongqing, overlooking the Yangtze river, and the only person in the Flying Tigers museum besides. So, I went to the Arsenal of Democracy in a way to help add some color to the things I have read about World War II in China – the sound of the Curtiss P-40 Warhawk, what the Douglas C-47 aircraft used to make the nerve-wracking journey over The Hump looked like from below. Thousands and thousands of people had emerged from their office buildings to join the tourists to watch the flyover, a rare event everyone could agree on. I made my way from my building at Farragut West and headed down 17th street, past the White House. The heat is already like summer but I can comprehend it, it’s not worse than Cambodia, not yet, anyway. As I was nearly to the mall and passing the Association of American States, I saw some of the first planes go over, in a tight formation, somewhere far away. I hurried up, hoping I hadn’t missed anything. The airspace around Washington D.C. is some of the most tightly restricted in the world, locked down even more after September 11 – a topic I know a little about, as I am bound to know all kinds of tiresome things about FAA regulations on unmanned aerial vehicles. So to see anything flying in this vicinity was a bit of a novelty in and of itself, an exotic sight. People were massed around the Washington Memorial, but the crowds looked ike a sweating, nostalgic Woodstock. 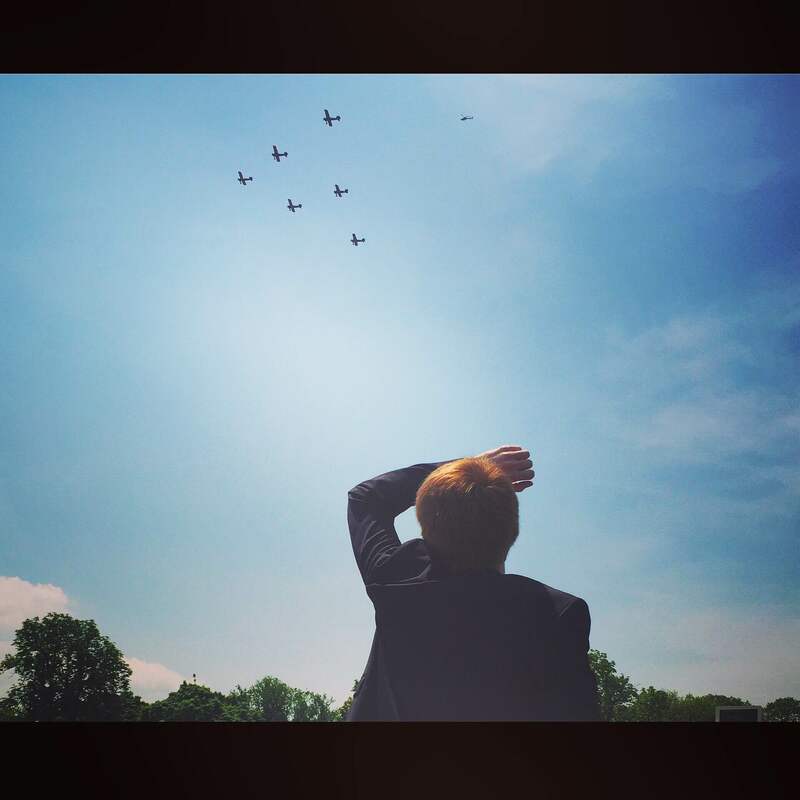 I weaved through them, stopping for a moment to take a picture of a young red-headed man who was staring up at the sky, as an early formation of planes went overhead. I had come to the place in large part for the acoustics, to get a sense of what these particular, historical airplanes sounded like overhead, but there was highly obnoxious jackhammering going on around, from the perpetual revamp of the Mall, and I kept walking. I headed for the WWII memorial instead. Famous airshow announcer Rob Reider was commenting in a typically silvery voice and I stayed put, grateful for the interpretation, which I could really use. I only recently became interested in aviation, I was never the kind of person who could identify a certain model of historical airplane from just glancing up at the underside for five seconds, as Reider spoke in a voice that was entirely suitable for a special presentation on the History Channel about what was to come. The first formation was composed of trainer craft: the Piper L-4 Grasshopper, the Beech AT-11 Kansan with its glassed-in nose, the North American AT-6/SNJ, the Boeing Stearman PT-17/N2S. People applauded in scattered and perfunctory chunks as the planes went over, although it was very evident the pilots couldn’t hear them – which, in that case, what were we applauding exactly? At the memorial, the first rows of folding chairs were reserved for veterans of the war, and there were lots of them, in olive green uniforms and military hats, looking up at the sky with baseball hats on, with wives and children sitting beside them, often clutching their forearms. Young soldiers in vintage paratrooper gear stood and looked over the water. 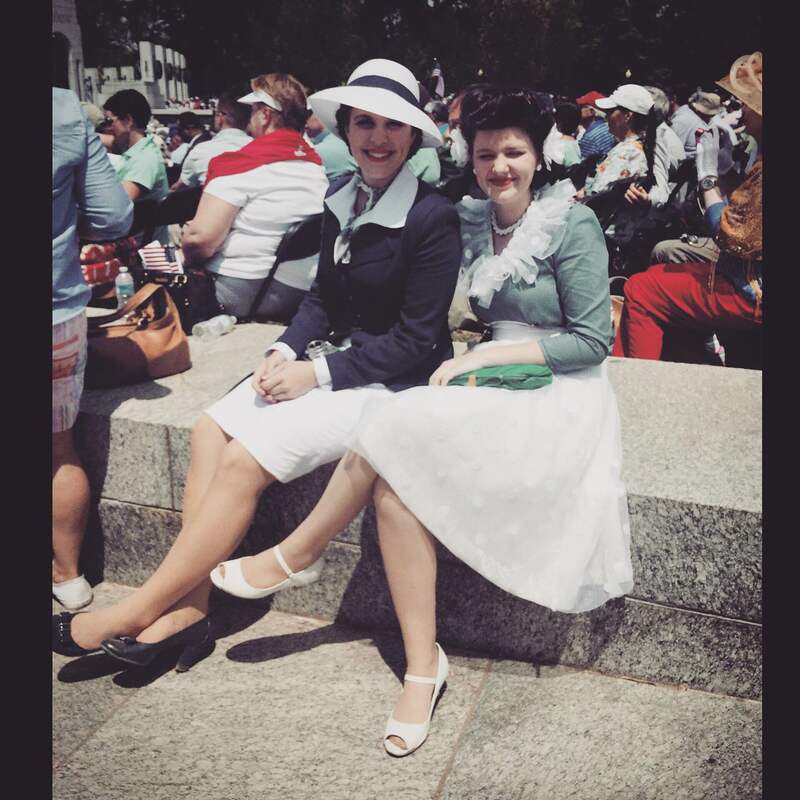 I photographed two girls in WWII outfits, in blue and red, who smiled prettily. A man in a old Navy uniform, with stark white bell bottoms, patrolled the area and frowned a lot while shooting pictures. I circulated around the area, trying to figure out where the source of the announcement was coming from, but I could never quite get sight of him. “And our special guest former senator Robert Dole!” he announced, and everyone cheered. I tried to stand up and see what Robert Dole looked like from one of the raised platforms around the WWII memorial but couldn’t pick him out of the crowd, which was a disappointment, since I recalled going through the 1996 elections as a young child and having no clear conception of his appearance (beyond “elderly). As I looked down to the platform where the special guests were, the planes kept going overhead – there were 56 of them in all, and they would all go over our heads over the next 40 minutes or so, in formation according to certain battles or some other (somewhat loose) historical association. The weird shape of the Lockheed P-38 Lightning, which famously and retributively shot down Adm. Isoroku Yamamoto. The speedy North American P-51 Mustang, of which there were seven present at the flyover, and the Grumman F4F Wildcat, which went toe-to-toe with Japan’s Mitsubishi A6M Zero. On the platform below, I watched as a group of veterans with artificial legs, most about my age, walked below, taking pictures with one another, and I looked at them for a moment, then felt strange about looking at them, about noticing the particular nature and origin of their injuries. I looked up at the planes again, to break up the weirdness of the moment, the noticing : a huge Boeing B-29 Superfortress cut through the sky ahead of us, and everyone stared at it for a moment, a little moment of distinct mechanical reverence, tinged slightly (perhaps I imagined this) with fear. 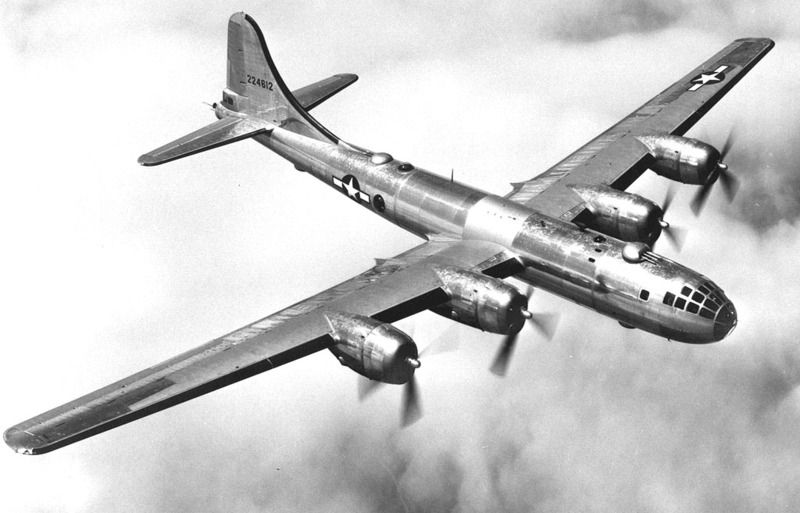 It is the only flyable B-29 Superfortress in the entire world, and I did feel lucky to see it, outside of computer-generated versions of such in nostalgia-drenched movies – an enormous black form, as big as you had imagined it if you were prone to historical re-imagining. They are the planes that dropped the atomic bomb on Japan. This was not, I think, mentioned in the commentary. The last formation was devoted to the dead of America’s air wars in WWII, the Missing Man Formation, composed of the gull-winged Vought F4U Corsair, the Curtiss P-40 Warhawk, the North American P-51 Mustang, and the cyan-colored Grumman TBM Avenger. “This is the symbolic moment of this flyover,” Reider told us, in case we were wondering what to feel, and also wondering why one plane would intentionally fall away from the others, which would perhaps be the kind of thing everyone would Tweet about. “Everyone should stand,” he added. Someone started to play taps, and all the veterans rose to their feet and saluted, and in that moment I felt like I should salute too, but I didn’t, although at least I was standing up. My sensation of patriotism, which is fickle and odd, emerged in me for a bit and I had uncharitable thoughts about the people who remained splayed out on their lawn chairs and on their towels, who failed to meet the moment with reverence, or at least with bothering to entirely notice. The planes came over, with one plane – either the Mustang or the TBM Avenger, I can’t tell – with a plume of colored jet trail behind it, meant to represent the smoke from a direct hit. It fell away as it passed over our heads, and was gone. That was the end of the flyover. We all started to walk back immediately, to get out of the sun. “Remember: if you speak English, thank a veteran,” he reminded us, as a sign-off. A woman began thanking people.